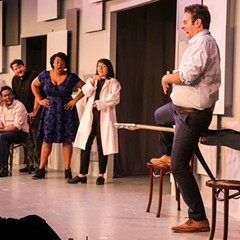 Hubbard Street and Second City try out the ole song and dance to make 'em laugh. Hubbard Street Dance and the Second City are cultural institutions in Chicago. And, if you think about it, they're pretty similar at their cores—each uses improvisation and new ideas to create a contemporary version of an ages-old art form. In fact, when I talked with comic Tim Mason and dancer Robyn Mineko Williams for the Fall Arts guide, both seemed pleasantly surprised at how similar their processes were once they started working together. Really, it seems weird that these companies haven't come together before now. Their collaborative performance, The Art of Falling, which opened last night, touches briefly on the fundamental differences between dancers and, well, everyone else. A loose narrative centers on the relationship between an outgoing, emotionally stable dancer and a nondancer who is afraid to say "I love you." We also follow an office temp with a crush on an officemate, and an odd pair who connect on a turbulent flight, but the stories aren't really that important. They're just excuses to merge dance and comedy, which they do in a bit that features dancers acting as Flinstone-esque office supplies and another number in which movement is cleverly restricted to the tight aisles of an imaginary Southwest flight. It's hard to say which faction was ultimately pushed more out of its comfort zone. Dance is a medium infected with comedy; the earliest ballets relied on slapstick for laughs, no matter how dark the overall premise. Comics, however, are not known to be graceful. Yet there they were in the opening number, holding their own next to Hubbard Street's ensemble, easy to spot only because of their lack of proper attire—professional dancers don't usually perform in socks. But the collaboration seemed equal in the effort put forth; the dancers were also pushed to great success. Using a typical crowd-work setup that would lead to an improvised scene at Second City, it was instead dancers who took suggestions as inspiration for a completely on-the-spot number that was executed with such confidence it was like they'd been working on it for months. Who would have thought the suggestions of "cat," "the news," and "VCR" from an adorable elderly couple in the front row would lead to such a sharp piece? Hubbard Street should take audience suggestions more often. The entire show skillfully balanced moments of pure dancing, moments of pure sketch, and, when it was at its best, moments when the two overlapped, which often manifested as musical numbers. 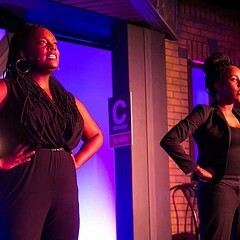 Proving that the two groups wanted the performance to be innovative beyond its initial conceit, one such number was performed entirely on the floor, and an overhead camera captured the movements of dancers as members of the Second City ensemble stood at the front of the stage and sang "Oh! You Pretty Things"—just one of five David Bowie songs used throughout the night, much to my delight. What really made the show so enjoyable was that everyone rose to the occasion and seemed to have a lot of fun doing it. With a tighter edit on the story and a few more songs, this could be a great musical, but even as it stands I hope it's something both companies leave in their repertory. A four-day run is too short for the number of people who should enjoy this innovative, entertaining night of theater. A poor casting choice damages the theater’s new main-stage revue. The latest E.T.C. show, A Red Line Runs Through It, shows that even the oldest sketch institutions can make progress.